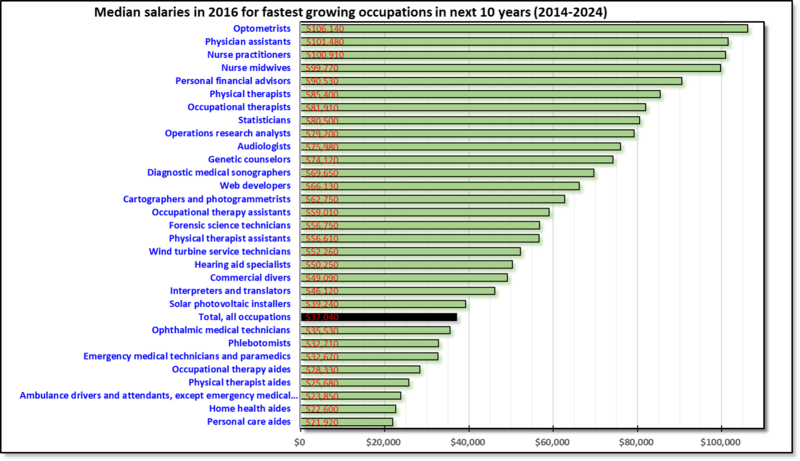 (Click on the image to enlarge) The US Bureau of Labor Statistics projects that fastest salary growths in next 10 years will be in healthcare. As baby boomers retire, services catering to the aging population will see more growth than others. Since medical specialists are scarce, staff supporting the specialists, e.g., physician’s assistant and nurses will see a much higher growth than average profession. However, it is not clear why Optometrists will see the highest growth although longer life span and an aging population will certainly add to their business. The next big growth in tech sector will involve understanding the enormous data we generate. And statisticians will be at the center of this growth. Similarly, analysts with background in operations research & business analysis will benefit as companies like Amazon, Walmart & Google fight it out in e-commerce and online shopping. Other health care professions that do not require significant training & specialization will see the lowest growth. Aides helping the aging population should expect much more jobs, as much as half a million, but shouldn’t expect much higher salaries due to short training periods, lower barriers to entry, and easy replacements. For the projected growth of these jobs, see Chart of the day – Aug 31, 2017.